Blue Bell Rotary supports our local community, and we're happy to share in service with the Whitpain Township Centre Square Fire Station. Our felllow Rotarians presented a check to Doug Thomas and Darren Meyers for 2 years of a 5 year pledge by the Rotary Club toward their new fire house. 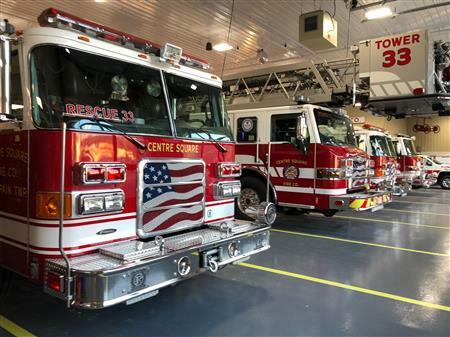 They moved into this new fire house at the beginning of 2018 which replaced their existing building they had been occupying for over 60 years. Their new building was designed to include ease of access for the fire equipment, bunking facilities for the members during emergency situations and state of the art electronics allowing them to better serve the community. 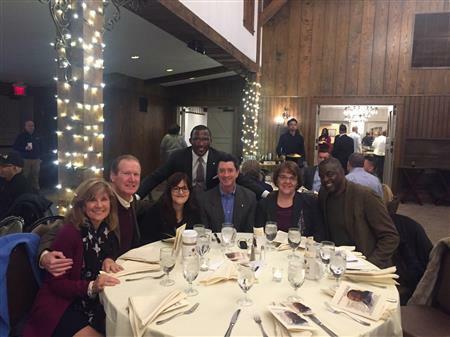 Our members showing their support at the American Legion's celebration of Dr. Martin Luther King, Jr. at Normandy Farm. Our Rotarians worked with the Hope Gardens team and other Rotarians in the district to upgrade one of their apartments for a new family in need. 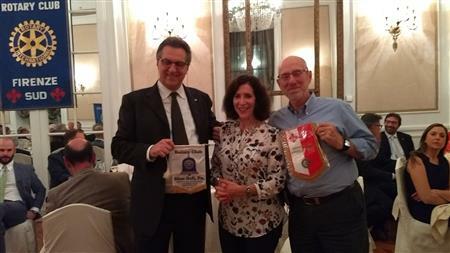 Fellow Rotarian Andy Johanson and his wife Wendy attend a meeting in Florence, Italy! Wissahickon Valley Boys and Girls Club Grand Opening! The grand opening ceremony for the Wissahickon Valley Boys and Girls club was held September 6th. Our Blue Bell Rotary Club has supported them actively and financially over the years, and we were blessed with the opportunity to celebrate this wonderful occasion alongside them. Learn more about them on their Facebook page HERE. Our new President, Lei Barry, presented our most recent past President, David Heins, with the Presidential Plaque to commemorate his upstanding service to our club and the community in his role for the 2016-2017 year. Sunday, April 30 WHS students from the Interact Club and Rotary Youth Exchange teamed with Blue Bell Rotary members at the 6th Annual Pancake Breakfast for SARS - Whitpain's Second Alarmers Rescue Squad. Alex Wee, Andrew Tran, Aneesa Wermers and Dana Kuo from Interact, along with Daniel Berrins and Eva Konis from Rotary Youth Exchange worked together to do whatever was needed to make the Pancake Breakfast for the emergency rescue squad run smoothly. Truly a fantastic demonstration of Rotary's ability to bring people together in our community. Great time volunteering at Cradles to Crayons by our Rotarians. We spent 2 hours making sure some of the estimated 70,000 needy children in the Phillie Area get the clothes, school supplies and books they so desperately need. Stay tuned for our next date! Come eat your fill of delicious pancakes (and eggs and sausage), help support the Second Alarmer’s Rescue Squad and visit beautiful Manor House at Prophecy Creek Park, all on a (guaranteed) sparkling April morning. The Blue Bell Club of Rotary is once again offering its All You Can Eat Pancake Breakfast on Sunday, April 17th from 8:00 to 11:30 a.m. at the low price of $8 for adults and teens and $5 for children between 3 and 10 (cash or check). Kids – and adults – will also have the opportunity to have their pictures taken with Elmo, Spidyman, or their favorite Snow Queen princess. The Second Alarmer’s will have one of their rescue vehicles there along with lots of their cool, high-tech equipment. This event is great for families, scouting groups and Sunday School classes as well. All proceeds from the event will go to the Second Alarmer’s to help pay the costs of their brand new facility in Blue Bell. Tickets may be purchased at the Whitpain Township building during its regular hours of operation, or at the door. The Manor House is located at 205 Skippack Pike in Blue Bell, near the intersection of Skippack Pike and Narcissa Road. Randy Brock, President of Rotary of Blue Bell, said recently “ Our club looks forward to our annual, 5th annual, community event where or focus is on community and fun!” Day or night, in any emergency, SARS is always there to help our residents, the visitors, and the business members of our community. They are, quite simply, the best and have recently been awarded the AHA SILVER EMS AWARD for outstanding cardiac care. The station averages a 5 ½ minute response time to emergency calls; well below the EMS national 9 minute response time. When every second counts, it’s easy to understand the draw to our community with emergency support like SARS for our residents. Sponsors include Univest, Robert Fair Caterers, Saxby’s Coffee and Whitpain Township. 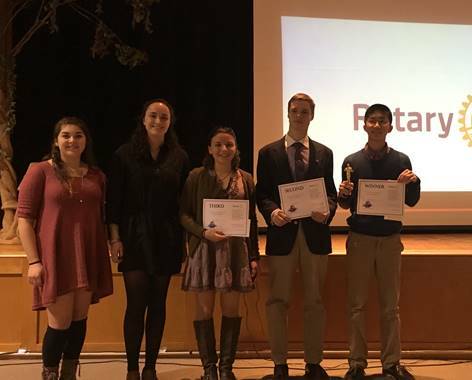 The Rotary Club of Blue Bell conducted its annual Four Way Test Speech Contest at Wissahickon High School on February 18, 2016. The contest challenges students to prepare a speech on some issue of importance to them and to use the Rotary Four Way Test to analyze the issue. All five contestants were well prepared and demonstrated both an understanding of the Four Way Test and the analytical skill to apply the test to their chosen issue. The top three students won cash prizes. In third place, Lindsey Fritz spoke passionately of the moral and ethical considerations of Veganism. Second place winner Jon Pogorzelski looked at the issue of the underfunding of public defender offices and the lack of equal justice for indigent defendants. First place winner David Huang, talked of the undue pressures on many teens to focus too much time and energy getting into the right college, instead of focusing on becoming a lifelong learner. David will be representing Wissahickon High School in the regional contest on Saturday, March 19 starting at 10:00 a.m. in College Hall at the Blue Bell campus of Montgomery County Community College. The winner of the regional contest will compete at the Rotary District 7340 conference in Gettysburg at the end of April. The 2014-2015 recipients of the RI Service Above Self Award, Rotary International's highest honor for individual Rotarians includes our own Patti Smith! This award recognizes Rotarians who have demonstrated exemplary humanitarian service, especially those who have helped others through personal volunteer work and active involvement in Rotary. 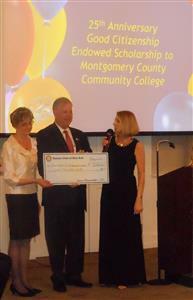 The Rotary Club of Blue Bell is pleased to announce its commitment toward education here in the local community with its pledge of $25,000 toward Montgomery County Community College Foundation’s Futures Rising campaign with The Blue Bell Rotary 25th Anniversary Good Citizenship Endowed Scholarship. Sixteen mothers die in childbirth in Uganda every day. “How can we make a difference?” is the question Ryan, then a medical student at Drexel University College of Medicine, posed to his father several years ago. The result of that question and his father’s, Ron Smith, Rotary membership was to bring together staff from two medical schools - Drexel University College of Medicine in Phila. and Makerere University School of Health Sciences in Kampala, Uganda. In 2014, Drexel and Makerere began an exchange of ideas, technology, and staff to find ways to reduce mortality and morbidity during and after childbirth and improve access to essential medical services. Ron Smith, member of the Rotary Club of Blue Bell and recent recipient of the Drexel University Alumni Association’s Service to Community Award, established a Maternal and Child Health project. Through partnerships from other clubs, Drexel University College of Medicine, and interested parties, this program will establish a sustainable interchange of healthcare ideas and training of healthcare professionals. All of this, from one idea. SARASOTA, Fla., April 15, 2015 – As National Volunteer Week, April 12-18, is being observed, Allan Syphers, a member of the Rotary Club of Blue Bell of Rotary District 7430, has been recognized by President Obama and humanitarian organization, ShelterBox USA with the President’s Volunteer Service Award for his efforts in 2014 to assist disaster survivors. When disasters like Cyclone Pam in the Vanuatu and the Syrian refugee crisis strike, many want to help. Syphers took action for ShelterBox, an international disaster relief organization that delivers emergency tented shelter and other lifesaving supplies to survivors of disasters and other humanitarian crises. Through Allan’s efforts of raising awareness and funds for ShelterBox, the organization was able to respond to more than 23 disasters last year, providing families with disaster relief tents, cook stoves, water filters, blankets, mosquito nets, children’s packs and other essential equipment. In one of the more busy years in ShelterBox history, ShelterBox has sent aid to support more than 10,500 families. Ummm, pancakes! Come eat your fill of delicious pancakes (and eggs and sausage), help support the Second Alarmer’s Rescue Squad and visit beautiful Manor House at Prophecy Creek Park, all on a (guaranteed) sparkling May morning. The Blue Bell Club of Rotary is once again offering its All You Can Eat Pancake Breakfast on Sunday, May 3, 2015 from 8:00 to 11:30 a.m. at the low price of $8 for adults and teens and $5 for children between 3 and 10 (cash or check). The Rotary Club of Blue Bell conducted its annual Four Way Test Speech Contest at Wissahickon High School on March 17, 2015. The contest challenges students to prepare a speech on some issue of importance to them and to use the Rotary Four Way Test to analyze the issue. All seven contestants were well prepared and demonstrated both an understanding of the Four Way Test and the analytical skill to apply the test to their chosen issue. For Dr. Andrew Johanson, charity begins at home, extends through the community and reaches out as far as Columbia and the Philippines. Johanson is a licensed family and marriage therapist who has lived in Ambler for about 12 years. He has a private practice during the day, with offices in Lansdale and Bethlehem, and he dedicates much of his free time to the Rotary Club of Blue Bell, an organization that supports both local efforts and global causes. Community members in Blue Bell chowed down for breakfast to helps support first responders Sunday. The Blue Bell Rotary Club held its third annual pancake breakfast at the Manor House at Prophecy Creek Park April 27 from 8 to 11:30 a.m. The event featured a special visit from the Phillie Phanatic and Elmo from Sesame Street. Proceeds from the event benefitted the Second Alarmers Rescue Squad. It was all laughter and smiles as the lovable, green Phillies mascot paraded into the building, causing harmless mischief and posing for pictures wherever he walked. In between the eggs, sausage, pancakes and coffee, those in attendance followed the Phanatic to see just what he’d do next. Later Elmo danced and waived to the many smiling children who greeted him. Community members in Blue Bell chowed down for breakfast to help support first responders Sunday. Blue Bell Rotarian Polly Beckham developed a new idea for a service project for Blue Bell Rotary Club, and like all good Rotarians she has pursued her new idea to fruition. It all started with a conversation at the San Diego Zoo nine years ago. Through curiosity, and his son’s study of pediatric medicine, Ron Smith became involved in a much larger cause. Smith, founder of Lansdale’s S-Bond Technologies, met Tusu Tusubira in San Diego at a conference in 2005 training Rotary leaders from around the world. “He had this great smile and was extremely welcoming,” Smith said. While visiting the San Diego Zoo and observing an African exhibit, Smith asked Tusu what it was like viewing an African exhibit that was meant to represent his own country and continent. From there a friendship blossomed. Smith, a member of the Blue Bell Rotary Club, then commenced a relationship between his home Rotary and Tusu’s club in Uganda - Kampala North. Einstein Medical Center Montgomery, the Rotary Club of Blue Bell, and Montgomery County Community College will continue their long tradition of promoting healthy living when they host the 14th annual Montgomery County Wellness Expo on Saturday, March 22, from 8:30 a.m. to noon. The free event takes place in the Physical Education Center at Montgomery County Community College, 340 DeKalb Pike, Blue Bell, PA (use Cathcart Road entrance), and includes health screenings, educational information, wellness activities and giveaways. Pennsylvania Gov. Tom Corbett made a stop in Blue Bell to speak with Rotarians about issues facing the Commonwealth. The governor attended the Rotary Leadership dinner at the Manor House at Prophecy Creek, 205 W. Skippack Pike, Jan. 29. The event was sponsored by the Rotary Club of Blue Bell. Blue Bell Rotary members visited the Ambler Mattie Dixon Community Cupboard as part of our club’s focus on food initiatives. We were warmly welcomed and given a short tour to see the food pantry, clothing boutique and education rooms by which the Community Cupboard serves about 400 families. Food is delivered to elderly clients and the food “store” is open twice a week for families to come in to choose food and supplies they most need. The Community Cupboard also provides education and basic nursing care. The Blue Bell Rotary Club provided its support to Mattie Dixon in the amount of $2000 with a check presented to Executive Director Christine Bouley by BBRC members Rusty Beardsley, Bruce Dearnley and Jon Lundy. Gwynedd Valley volunteer and Blue Bell Rotarian, Allan Syphers, has been recognized by international disaster relief organization, ShelterBox, for reaching a major fundraising milestone this year. Since joining the organization as a volunteer fund raiser in 2009, Syphers has raised more than $100,000 for disaster survivors worldwide. Our agencies have seen a 26% increase in need over the past year compared to a 22% increase from the year before. 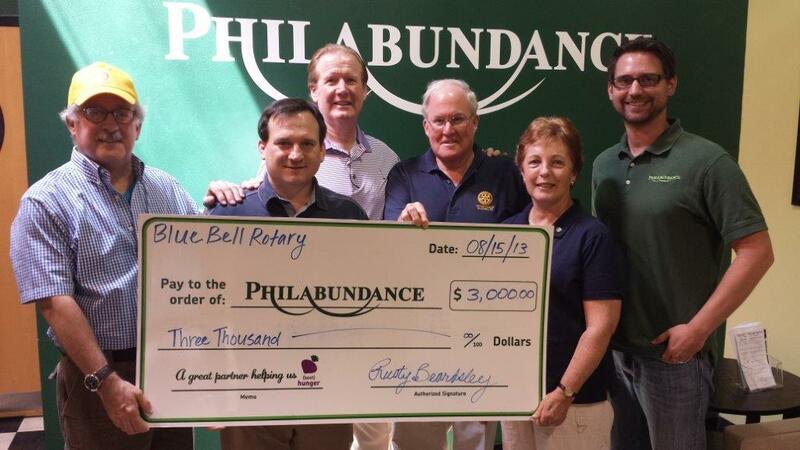 Blue Bell Rotary supports Philabundance to address local hunger here in the Montgomery County local area. Sally Hurwitz has helped turn her passion for helping others into a thriving not-for-profit organization in Ambler. The co-president of the after-school program for at-risk elementary schools students called Stars, Hurwitz and fellow Co-President Dee Coyle — next week’s Citizen of the Week — were recipients of the Blue Bell Rotary Club’s Citizens of the Year for their dedication to helping positively change the lives of area students. Hurwitz said her involvement with the program comes from a desire to help others. June 22 marked a new beginning for April and her family. She will be moving into the Habitat home. Please check out the pictures and view a portion of the program. Read a portion of the Home Dedication program. We are thrilled to present this scholarship to Mark. In honor of former Blue Bell Rotarian and community leader, Tom Cassidy, this award is presented to those who have excelled during their high school career. The water well project for the Mukaa Community and Children's Home is underway. SARS breaks ground on their home here in Whitpain Township. St Mary's Gates Fully Painted! Another well done job for the community by the Blue Bell Rotary Club. Watch Andrew address the issues of cheating. Watch Brendan address the issue of cun control. Andrew came in first in our local club contest. He could not attend regionals, so Brendan attended. Brendan won and went straight to the finals. 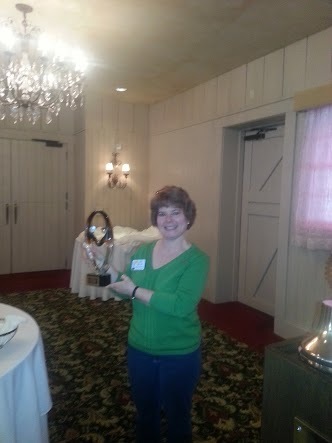 Yes, it's true Prez Lisa was recognized for her accomplishments and inspiration this Rotary Year. District Governor Tony presented the award during the District Conference. We are a Small but Mighty club. Blue Bell and Brendan Go to the 4Way Test District Finals! This past Saturday April 13th, Rotary District 7430 sponsored the 4 Way Test Speech Contest for high school students in each of its three regions. This is the third year that District 7430 held the competition and the SouthEast Regional Contest was held at Central Bucks South High School. Want to learn more about Rotaract? Around the world, when natural disasters strike or people are displaced by political upheaval or all-out war, Rotary International — a.k.a. the Rotary Club, the long-standing service and goodwill organization — distributes to those in greatest need a green plastic box that can literally mean the difference between life and death. 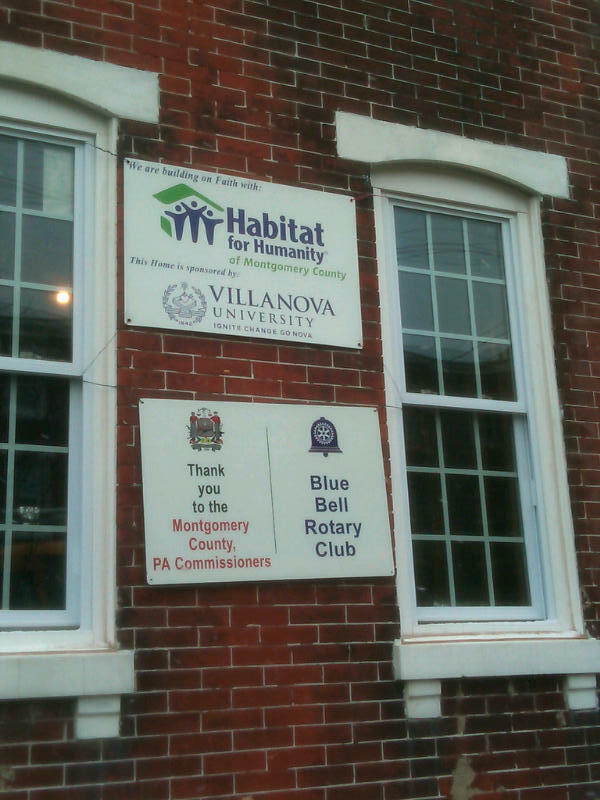 On Tuesday, Jan 22, Rotary of Blue Bell announced its support for a home in Norristown. Rotary will be working along with Villanova University to finish the preparation before the lucky family moves in. Move in date is targeted for June. We have launched our first work day and we're excited. Stay tuned for more details on work days and watch the progress here. The Rotary Club of Blue Bell is pleased to announce the 13th Annual Montgomery County Wellness Expo, to be held on April 6, 2013, from 9:00 a.m. until Noon. This community service event is held at Montgomery County Community College’s Physical Education Center and is co-sponsored by Einstein Medical Center Montgomery, Montgomery County Community College, and the Blue Bell Rotary Club. Special thanks to Teva Pharmaceuticals for supporting our participation and leadership in this year's event. We are excited to announce that the 2nd Annual Rotary Pancake Breakfast will be held on Sunday, April 14, 2013 from 8am to 11:30 am at the Manor House Prophecy Creek! Mark your calendars. All proceeds will again benefit Second Alarmers Rescue Squad to help fund the new Whitpain station. SARS provides life saving emergency medical services not only to Blue Bell, but also to residents in Abington, Upper Dublin, Upper Moreland, Hatboro, Jenkintown, and Rockledge. We are proud to support this group of dedicated professionals. Ron kicks off his journey to Uganda departing Jan 21 and will return Jan 30. He is looking for hospital sites remote from Kampala that we can work with in our Maternal & Child Healthcare Education and Delivery in Uganda. This is a 3 year program to increase the capacity and quality of Maternal & Child Health care in Uganda by improving related health care education and infrastructure. Rotary of Blue Bell announces its launch today in support of our international literacy project to outfit the Mukaa Primary School in Kenya with tables, chairs and shelves. This project is one of several ongoing partnerships with Sustained Acts. Tom Tillett leads Sustained Acts, which has a focus of creating sustainable programs that have long-term positive impacts on the lives they reach. As a partner, Rotary is ensured that the funds are properly managed and the effort is completed. In the words of Bruce Dearnley, Blue Bell Rotarian and a member of the international committee that is spearheading this effort,” We have people in Kenya on a regular basis who will oversee the work and make sure it gets properly accomplished”. We look forward to posting pictures as they become available! To our friends and neighbors in the Blue Bell Community, thanks for Your Continued Support. Together with Bethlehem Baptist Church, we were able to provide $4,000 to Watoto, enough to support 10 children for almost 1 full year. We are Community in Action and We are Fired Up for Rotary! To our community of friends and family: Thank you for joining us at the 7th Annual Chefs of the Burbs. You made this event a success AGAIN this year! As a result, we were able complete our $25k challenge for Habitat and strengthen our programs for local hunger, literacy and scholastic endeavors, local emergency response, plus international water, sanitation and emergency relief projects, and worldwide polio eradication. BBR's own Bruce Dearnley was honored for his work with ShelterBox USA, the Rotary-affiliated global disaster relief organization. Bruce exemplifies the Rotary motto of Service Above Self with cheerful enthusiasm. Read about Bruce's story in the Ambler Gazete and the Times Herald. The Blue Bell Rotary Club and District 7430 are leading a VTT in partnership with Drexel University in Philadelphia and Makerere University and the Kampala North Rotary Club in to improve the healthcare for mothers and children in Uganda. Blue Bell Rotary President Rusty Beardsley likes to tease when he talks of the silent auction items being offered in the 2013 edition of Chefs of the Burbs. Mark your calendars for March 12, 7pm for our local 4Way Speech Contest with WHS. To prepare, check out this HIGH SCHOOL student, and winner of the 2011 4 Way Speech Contest. Divya Thomas received 1st Place in the 2011 Rotary District 6630 Four Way Speech Contest. She was sponsored by the Strongsville (Ohio) Rotary Club. Her topic was National Debt. 3- Does it build goodwill and better friendships? 4- Is it beneficial to all concerned? Blue Bell Rotary volunteers came out for a painting "party" to spruce up the elegant entrance gate to St. Mary's in Ambler. Bruce Dearnley brings greetings and the club flag from Nairobi Hurlingham Rotary Club, our new Host partner for the proposed Mukaa Children's Home and Mukaa Community water well and distribution system. BBR is considering the project. The intrepid Bruce returns once again. Accepting on our behalf is President Dale Rubinkam.